The word ‘disruptive’ is thrown around a lot lately. It made Forbes’ list of the 10 most overused startup buzzwords. But there’s a good reason for that. Disruption is all around us. It’s better to acknowledge and embrace that fact (even at the risk of overusing buzzwords) than to ignore it and find yourself marginalized in a world that has changed right around you. These are a few of the thoughts that went through my head on reading Disrupting Digital Business. Tzuo is speaking of MBA programs in this quote. But I’ve had similar thoughts about the practice of marketing. As business models change from selling things to selling subscriptions and memberships, marketers that don’t adapt their practices to match the revenue model risk becoming less and less relevant. Looping back to Ray’s book, marketing has a critical role to play at this moment because the brand promise is essential in an age of digital disruption. In this evolving world, marketing is becoming more relevant, not less so. It’s imperative that marketing organizations stay in tune with the changes happening in the business. All of these pieces should come together in interesting ways in Zuora’s upcoming Subscribed Conference in San Francisco next week. I’ll be there leading a panel on customer loyalty and super-users. Tien Tzuo, as the CEO of Zuora and a keynote speaker, will share his thoughts on subscription models and their evolution. 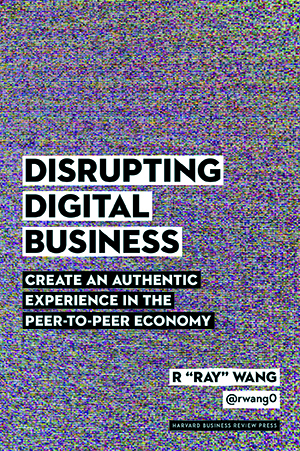 As another keynote speaker, Ray Wang will speak about disruption. And I can hardly wait to hear what everyone has to say. In the mean time, I recommend that you read Ray’s book and start thinking about the ways that the grounds may be shifting in your own industry.